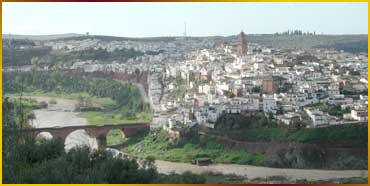 The town of Montoro is situated on the eastern side of the province of Cordoba and has a population of 9,500 inhabitants. It is 195 metres above sea level on the top of a hill surrounded by the Guadalquivir River . Its history goes back to the Neolithic period during the transition to the Metal Age as the axes found in the 'Cerrillo del Moro' and 'Palomarejo' bear witness. But it is likely the first enclave of the city was at the 'Túrdulos de la Beturia', though the discovery of designs with more than eighty symbols, hieroglyphics, and figures similar to others found on the banks of the Ison, in western Siberia and northern China could indicate the presence of people of Asiatic origin. The Phoenician and Greek historians Pliny, Ptolemy and the Antonine Itinerary gave it the name of 'Aipora', 'Ypora' and 'Aypora', which according to their Greek roots meant high viewpoint of the sky or town situated on high land . Later in the Roman period, it was called 'Epora' or 'Republica Eporense'; it was one of the three independent cities in Hispania, minted its own currency and was an ally of Rome . Afterwards, the Arabs occupied it for five centuries and was called 'Bayyana'. Montoro was regained definitively in 1240 by Fernando III. In 1628, the Dukedom of Montoro was created, which was given to the Count-Duke of Olivares to govern. King Philip IV ordered his party to stop at what is today known as the Realejo in order to admire the beauty of this city, which is surrounded by the Guadalquivir River over which crosses the majestic Bridge of the 'Doncellas' or of the 'Donadas' (i.e., of the Damsels or of the Donations because the ladies of the town donated their jewels for its construction). The modern day name of Montoro derives from the combination of the words 'monte del toro' (i.e., mount of the bull ). 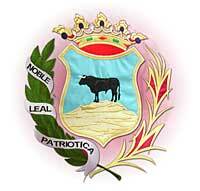 Although it is not certain where this name comes from, the town's coat of arms is nevertheless represented in this way. 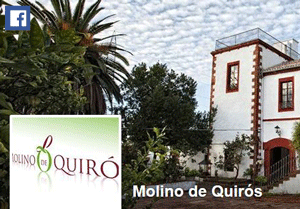 The town of Montoro , which looks to the north, represents the gateway to Sierra Morena. Its economy is based essentially on agriculture, especially on olive cultivation. With olive groves occupying a total of 22.558 hectares ( 55.741 acres ) (2% of the total in Andalusia), of which 75% are situated in the mountainsides, it is today one of the most important towns in Andalusia in olive oil production. Owing to the fact that there are seven oil factories in the municipality and a substantial auxiliary industry and technology to help the olive transformation industry, for many years now it is where the very famous biannual 'Feria del Olivo' (i.e., Olive Fair ) is held.